I came here with FutureGreg (FG) last week and sat at the bar on quite possibly the most comfortable bar stools in all of Los Angeles. Finally a place with cushioned seating at the bar, Hooray! Brittini Rae (Previously of The Tar Pit and Fig & Olive) was our wonderful bartender and got us started with a couple of interesting drinks. The menu items for both food and drink don’t technically have names here, so you order by the first ingredient which is highlighted in bold. I had the ‘Gin’ drink and FG had the ‘Campari’ drink. My drink included an ingredient called ‘Strawberry Shrub’ which Brittini described as a syrup made by steeping strawberries in sherry vinegar and sage. The drink was served in a collins glass with a nice long ‘Ice Spear’, it was a little sweet, a little sour with a bitter finish. The vinegar made me salivate and came through pretty heavily at the end of each sip, but I personally liked the sensation. The Campari drink wasn’t to my tastes but FG enjoyed the bitterness and said the Campari mixed with passionfruit tasted more like grapefruit juice and was delicious. The aroma on the drink was great but lost slightly in the tall collins glass. The other bartender Nate was playing with some flavor profiles and cocktail ideas and was nice enough to give us a taste of his latest creation. It was very good. 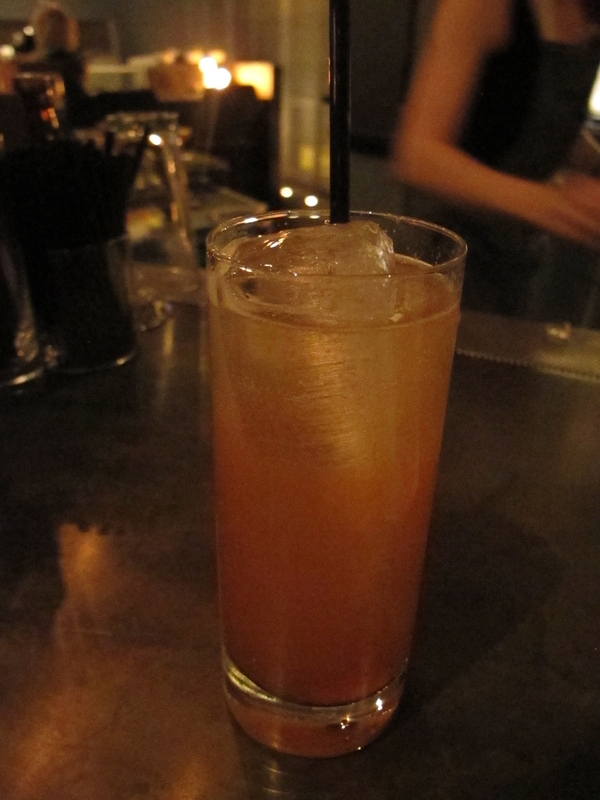 Buffalo Trace, Cinnamon Syrup, St Elizabeth All Spice Dram, Lemon Juice and the Strawberry Shrub. It was a great little drink and the favorite of the three we tried, hopefully they will add it to the menu in due course. The restaurant itself was attractive and modern, with clean lines and an intriguing curvy shaped ceiling design. The light fixtures intrigued me and the triangular bar was funky and different. Chef Michael Voltaggio is the man behind Ink and was the Executive Chef for José Andrés The Bazaar at SLS Hotel (one of my all time favorite restaurants). The Bazaar is one of the most interesting restaurants, both aesthetically and ingredients wise that I have ever been to. Voltaggio has clearly brought over some of these elements which were particularly apparant to me in the dessert. The chocolate dish was reminiscent of one we had at SLS on our last visit. 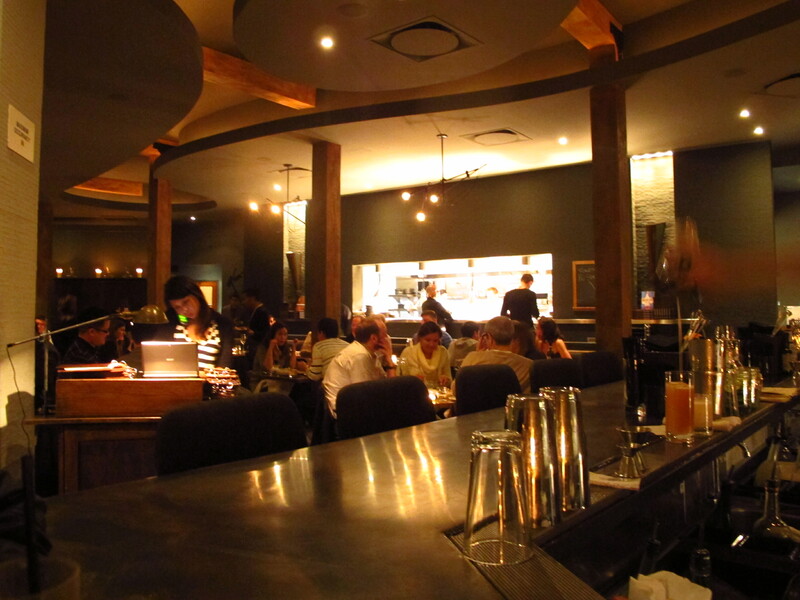 Voltaggio is most recently famous for his appearance on Season 6 of Top Chef with his brother Chef Bryan Voltaggio. You can read more about them both by clicking here or read their book ‘VOLT/Ink: Recipes, Stories, Brothers’ which is about both the Voltaggio brothers restaurants and includes some wonderful photographs and recipes. 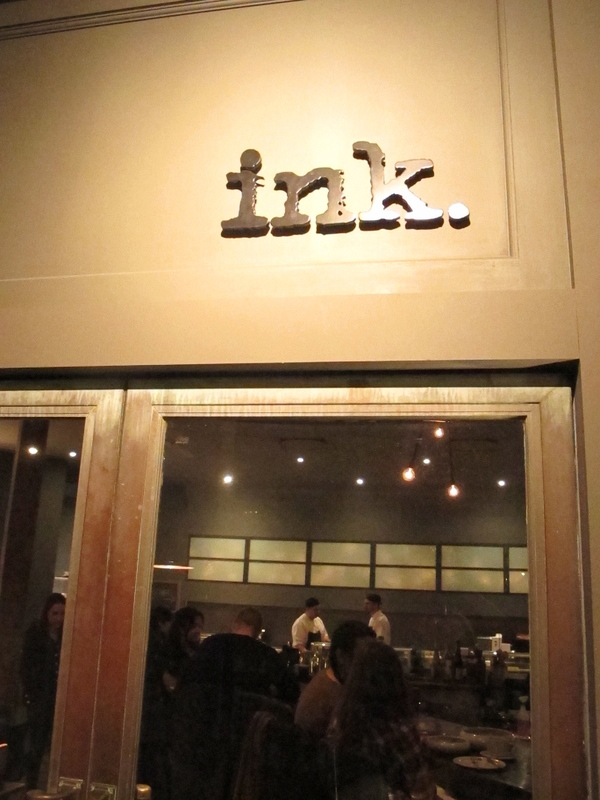 To me this restaurant is the epitome of unusual and innovative dishes. There were many ingredients on the menu that I had either never heard of, or would never have imagined trying. For example; Cardamom Soil, Fennel pollen, Almond-bonito sand, Oyster Leaf, Lamb Neck Gravy and Octopus Ink Shells! The main thing I’ve learnt from writing this blog is the ability to take a step back and try items that scare me. I admit, I didn’t go so far as to order the ‘Pig Ears’, but I am learning to trust the Chefs and bartenders/mixologists in what they choose to include on their menus. So far I have been truly amazed how many new dishes and drinks i’ve enjoyed. We ordered two entrees, the Pork belly and the Wagyu beef. My pork was cooked beautifully and was covered with crackling (which is technically crispy fat and doesn’t sound appealing, but was very flavorful and perfectly crunchy). The dish came with baby leek and one long pasta tube described as ‘Mac and Cheese’, my only complaint is the portion size of the Mac and Cheese. I could have done with at least three of those cheesy tunnels. They were so delicious. The richness of the pork belly and the cheesy pasta definitely competed with each other as strong flavors, but ultimately the crackling and drops of ‘charcoal oil’ (which added a smoky element to the dish) won. Overall it was very very good and I highly recommend it. FG really enjoyed his Wagyu beef dish and described the Tendon as being “similar to a slim jim but less salty”. He said the beef was succulent but the sauce tasted a little too meaty like ‘Salisbury steak meat’ which wasn’t what he expected and didn’t do the beef justice. The crispy rice cakes and the Horseradish tofu were interesting though and complimented the meat nicely. Overall he enjoyed the dish and finished it quickly. The Chocolate reminded me of a dish at ‘Bazaar’. Rich chocolate in shavings, crisps and logs of decadent truffle were on the plate. There were cookie crumbles, sesame cake crisps (amazing) and dense pudding pieces, also a spiced tofu which was really strange but helped balance out all the flavors. It was a very rich plateful and I couldn’t have eaten it without help. Brittini forced us (nicely) to try the Apple dessert, and i’m so glad she did. It was exquisite. The texture was creamy, and had almost like a caramel pot de creme texture. There were little apple balls and a meringue like ‘Burnt wood ice cream’ on top. Very interesting and tasty dish. Overall I felt the dishes were executed nicely, presented beautifully and tasted great. I noticed that every dish we tried utilized different textures as well which I found interesting. There were crunchy, soft, chewy and creamy elements on each plate which made for a real sensory experience. The menu was certainly diverse, but I feel it may be a little too unusual for some (fussy ones in particular!). The drink choices were not as diverse as the food options but I liked the one I had. The Strawberry shrub was certainly something new, and although I enjoyed my Gin drink I didn’t actually finish it (which is rare for me) because the vinegar flavor became a little too overpowering by the end. FG enjoyed his, although anything with absinthe isn’t my favorite. The drink Nate made as a test was excellent, but seeing as it’s not on the menu yet I can’t really include it when factoring the rating, I would give 4 out of 5 if it was. The restaurant was attractive, the vibe was modern and there were plenty of other great looking drinks and food options on the menu that I didn’t get to try. I will be sure to return in the near future.